Home» » AP Renewal services of Contract Degree Lecturers for the academic year 2017-18 as per G.o.No 9. 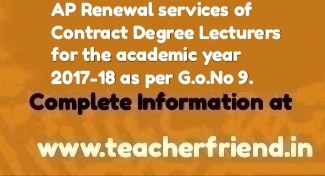 AP Renewal services of Contract Degree Lecturers for the academic year 2017-18 as per G.o.No 9. AP Higher Education Renewal of services of Contract Lecturers working in the Govet Degree Colleges for the academic year 2017-18renewal of services of (722) eligible contract lecturers from June, 2017 to,March 2018 who have been working in the Government Degree Colleges during the academic year 2016-17. - Permission Accorded Order as per G.O.R.T.No 9 Dated: 22-01-2018/AP Renewal services of Contract Degree Lecturers for the academic year 2017-18 as per G.o.No 9. G.O Rt No.206, Higher Education Department, Dt:02.09.2016. From the Spl.CCE, A.P., Vijayawada Lr Rc No.133/Ser.II/2017, Dt:05.06.2017. The Special Commissioner of Collegiate Education, Andhra Pradesh, Vijayawada shall take further action in the matter accordingly. This order issues with the concurrence of Finance (HR-II) Department vide their U.O.No.31025/118/2017, dt.25.07.2017.